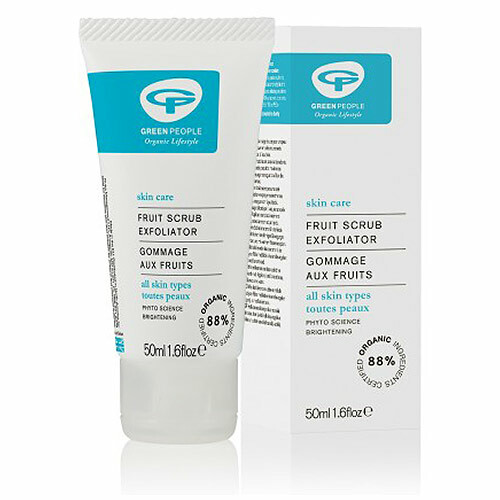 Green People Fruit Scrub Exfoliator is an effective natural exfoliating facial cream for deeply-cleansed, radiant skin and contains Organic Mandarin, Apricot & Carrot. Aqua (spring water), olea europaea (olive) fruit oil*, prunus armeniaca (apricot) seed powder, helianthus annuus (sunflower) seed oil*, butyrospermum parkii (shea) butter*^, glycerin* (vegetable derived), squalane (from olive oil), cetyl alcohol (emulsifying plant wax), cetearyl glucoside (plant derived emulsifier), cetearyl alcohol (emulsifying plant wax), elaeis guineensis (palm) oil*^, glyceryl stearate (plant derived emulsifier), aloe barbadensis (aloe vera) leaf juice powder*, simmondsia chinensis (jojoba) seed oil*, rosmarinus officinalis (rosemary) leaf extract*, althaea officinalis (marshmallow) root extract*, sodium stearoyl glutamate (plant derived emulsifier), hamamelis virginiana (witch hazel) water*, hydrolysed jojoba esters (from jojoba oil), aroma [lavandula angustifolia (lavender) herb oil*^, citrus nobilis (mandarin) peel oil*, citrus aurantium bergamia (bergamot) fruit oil*^, citrus limon (lemon) peel oil*], citric acid, benzyl alcohol, salicylic acid, sorbic acid, limonene*, linalool*, citral*, geraniol*. Apply to clean, dry skin using small circular movements. Rinse with lukewarm water, then a splash of cold. Follow with Vita Min Mask™ and a day or night cream of your choice. Use once/twice weekly. 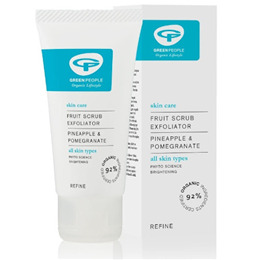 Below are reviews of Green People Fruit Scrub Exfoliator - 50ml by bodykind customers. If you have tried this product we'd love to hear what you think so please leave a review.